Everyone knows that if there was one place in the world to take the prize of most epic honeymoon vacation ever, it would definitely be the Maldives. Hands down, this place is very hard to compete with. Unrivaled luxury and the plethora of options to choose from all make Maldives the destination of a lifetime, and the obvious choice for honeymooners from all around the world. Swaying palm trees, over-water villas, stunning white sand beaches, fifty shades of blue waters… A ultimate sun-splashed romantic destination! 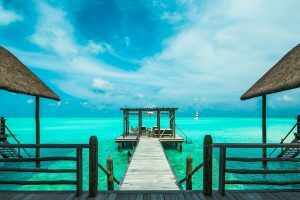 Whether you want a honeymoon, baby moon, or just a romantic gateway with your significant other, Maldives offers everything: from the castaway-chic to the ultra luxurious. 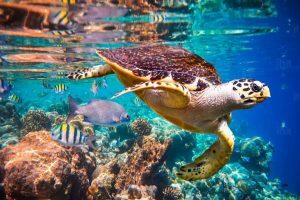 In this article I will provide a honeymoon guide and food you should not miss in the Maldives. 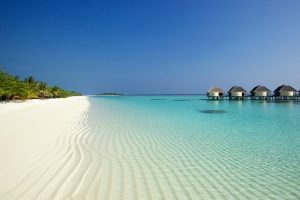 The best thing about Maldives is the fact that it has over 1,192 islands to choose from. This entails 122 resort islands, and plenty of activities to do. You can choose between private resort islands and local islands or both! That makes your trip a lot more exciting as you’ll be spending each day at a different island, discovering beautiful spots and a rich culture. Each island boasts at least a few beaches – from white sandy beaches to glowing beaches. Most of the time, you’ll be getting your own private villa to spend your time at. Don’t really know what your budget is? No problem at all! There’s literally property options for all budgets. 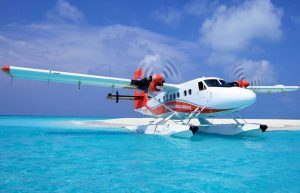 The entire water body around you is crystal clear and their cleanliness is maintained on a daily basis to the extent that you’ll be seeing every single coral reef from above. Despite the fact that Maldives is a strictly Muslim country, alcohol is permitted on all resort islands. Tip: Purchase your alcohol on the island. Don’t get it from the duty-free as it will be confiscated upon your entry to Maldives. Most of the resorts in Maldives offer all-inclusive offers. On resort/honeymoon islands, you can practically wear whatever you want. The weather is usually arm all year round in the Maldives but there are basically two main seasons. The wet season and the dry season. The dry season is typically in January through March, while the wet season lasts from May until November. Always look for online specials – there are a lot of all-inclusive options that can save you a lot of money later on. Make sure the weather forecast resonates with what you have in mind. Always check the location of where you’ll be staying: local island or resort island? Get ready for some of the most world-class diving you will probably ever experience. The high underwater visibility makes everything so much better. Stay in an over the water bungalow in the heart of Maldives. Who wouldn’t want breakfast in bed paired with unreal views of the ocean and the pool? Swim with whale sharks and unleash the adventurer inside of you. if you’re more of an adrenaline-seeking person, then swimming with whale sharks will surely make your life better! Relax with the hundreds of spa treatments and options. Which islands to stay at? You can choose your island based on your resort or you can choose your resort based on your island! For the best all-inclusive deals go to Constance Moofushi. 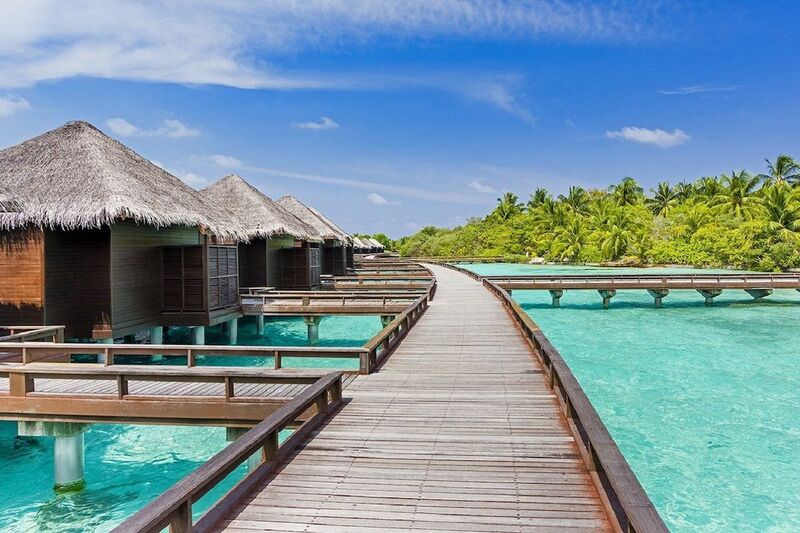 If you want the best relaxation and spa treatments, then definitely go to Como Maalafushi. For the best “no shoes, no news, just escapism” or “barefoot luxury”, then definitely go to Six Senses Laamu. For the best parties, definitely go to Finolhu. If you want to go to more affordable islands and not spend too much on luxurious experiences, then definitely go to Velassaru. For the ultimate Maldivian experience, go to Milaidhoo. Where to go for food? This resort is located in the island of Makunufushi. Over and over, this resort ranked high when compared to other honeymoon resorts. 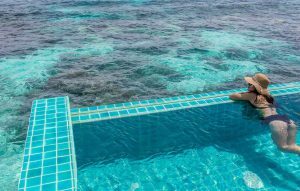 It’s all due to the incredible luxurious rooms, the exclusivity the overwater villas, the spa treatments, the private diving reefs and of course – the infamous infinity pool. This resort has over 30 overwater villas that you can choose from, and is usually considered more affordable than resorts. All without comprising the luxury and exclusivity you’d be getting at other resorts. This is most definitely one of those upscale resorts everyone knows about. Located in the island of Huvahendho, the resort also offers great all-inclusive rates. Conrad is where luxury meets style and comfort. It’s set on two islands, and you can access it through a seaplane flight (which honestly adds a lot to the experience!). You’ll find whale sharks, manta rays and much more just below you. The resort houses more than 11 restaurants and bars including the infamous Ithaa – the famous claim to fame! 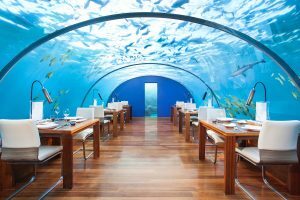 The restaurant is actually located underwater and has the world’s best cheese at the cheese Bar along with a wine cellar that has over 20,000 bottles of fine wines. This is the ultimate escape from tourists. 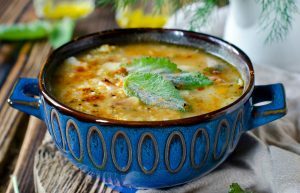 You will be mingling with locals from all around and really savoring the huge variety of dishes they have including dish curry, shrimp fried rice and much more. Of course Maldives is renowned as this perfect honeymoon destination, but often people ignore the incredible gastronomic experience that the country offers. There is a lot more to Maldives than just sipping on smoothies, or savoring fruits on a hammock all day long. The Maldivian Cuisine is the ultimate blend between Arabic, Indian, Sri Lankan and Oriental cuisine…All in one! Fish and coconuts are the top two staples of the Maldivian diet but then again, there’s a lot more variety when it comes to the cuisine. Garudhiya – this is basically a fish broth (usually tuna) that is served with lime, chili and onions. For breakfast, you will also be eating fish. The most popular breakfast dish is the mas huni which is a blend of smoked tuna, onion, coconut and chili. Some other popular dishes include: Fihunu Mas and Bambukeylu Hiti. For the snacks – again, more fish based meals! The most famous snack is called hedhikaa and is also made of tuna and coconut. Pay a visit to the Miladhoo islands where you can actually learn how to make one of the traditional recipes boasted by Maldives. You’ll be joining local fisherman to catch fish, and then learning how to make the food from scratch! There really is no need to go over how much Maldives is the perfect honeymoon destination. For years it has topped all bucket lists, all to-visit lists and has definitely been the most sough-out honeymoon destination. How can anyone resist crystal water, gorgeous weather all-year-round and white sandy beaches? Not us, for sure! Next Post What A Gorgeous Brunch At Le Meurice!